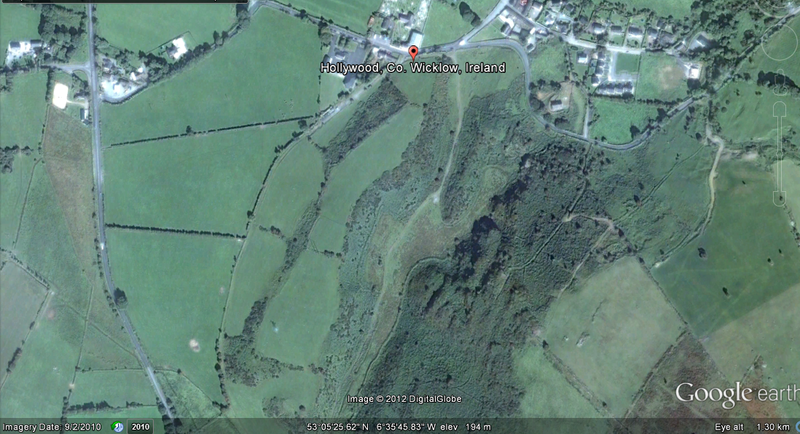 Hollywood, Co Wicklow could not be further from its glitzy namesake in Los Angeles. This quiet rural village is a really interesting place and has its own unique charm. There is much about the history of pilgrimage at Hollywood that we do not know, but I firmly believe that this little village played a very important role in the early and later medieval pilgrimage landscape of the King’s River Valley and was a stop for pilgrims en-route to the shrine of St Kevin at Glendalough. Located at one of the main entry points into the King’s River Valley, the village is traditionally held to be the starting point of St Kevin’s road, a well known medieval pilgrim route . The route of St Kevin’s road cuts through the Wicklow Mountains via the King’s River and the Glendassan Valleys. The road linked Hollywood to the ecclesiastical site of Glendalough. Over the centuries countless pilgrims would have passed through Hollywood when travelling to Glendalough. Unfortunately there are few historical sources relating to Hollywood. The first mention of the area is in a charter granting land and the right to build a castle here, to the de Marisco family in 1192 (Price 1983, 207-08). All that remains of the castle is a large Medieval Motte located at the edge of the modern village. 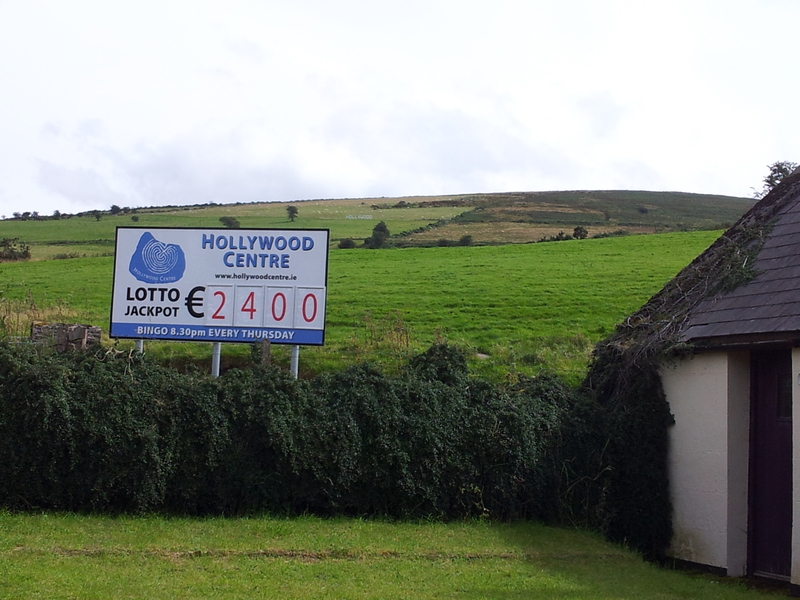 The charter and subsequent documents refer to Hollywood as Bosco Sancto or ‘holy wood’ interestingly a later sixteenth century source refers to the area as Cillín Chaoimhín or the little church of St Kevin. This late reference confirms links with St Kevin the founder of Glendalough and alludes to the existence of a church and cult associated with the saint. I believe that this association has a much earlier history. Folklore suggests that St Kevin spent time here in retreat before he headed across the Wicklow mountains and founded the ecclesiastical site of Glendalough. It is possible that a small church or hermitage may have existed at Hollywood in the early medieval period. The earliest mention to a church at Hollywood is found in a thirteenth century charter but no physical traces of the medieval church survive. 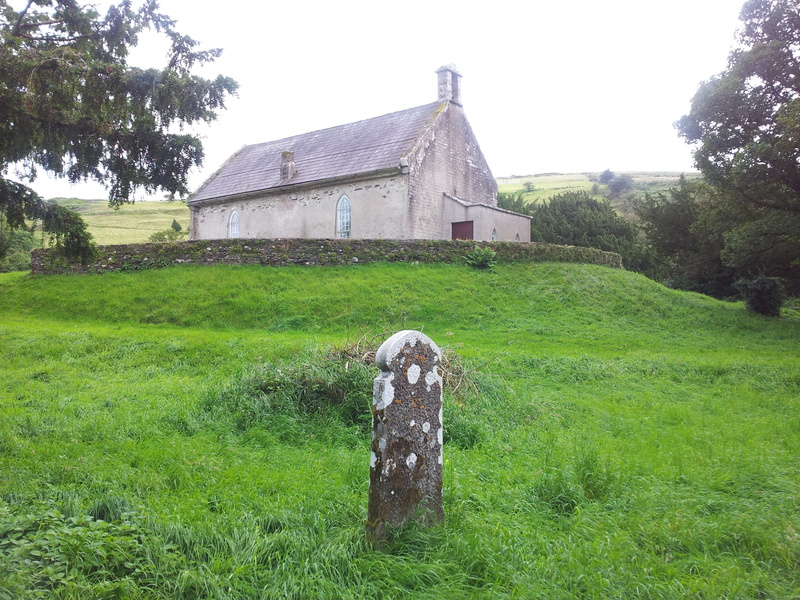 Its location is likely to be the site of the seventeenth century Church of Ireland. The seventeenth century church built on the site of the earlier medieval church at Hollywood. Five medieval cross slabs dating to the thirteenth-early fourteenth century are to be found in its surrounding graveyard and they represent the only visible evidence of medieval ecclesiastical activity (Price 1983, 208; 216; Corlett 2003, 99-100; 105). Medieval Cross Slab at Hollywood. All traces of past pilgrimage are located a short distance from this church in an E-W running valley at the edge of the village. The valley containing the pilgrim stations, is located below the village of Hollywood. 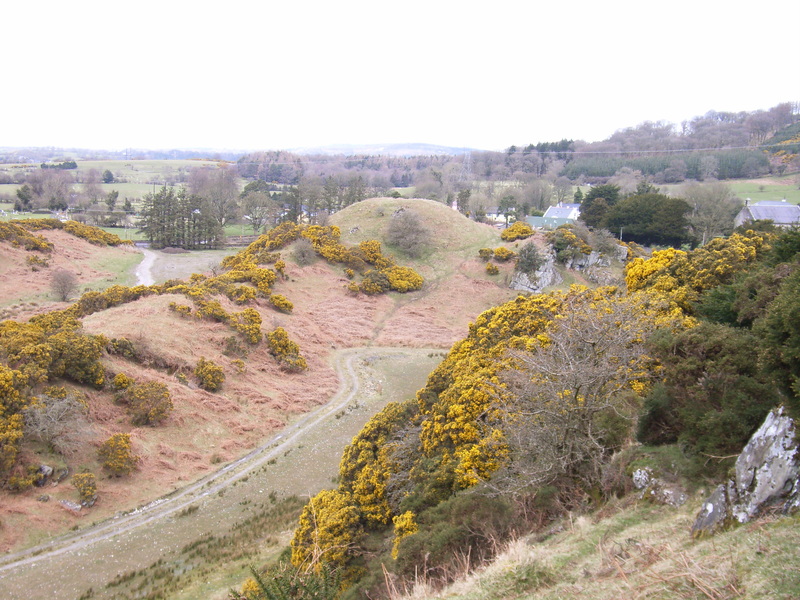 The aforementioned Norman Motte (site of the de Marisco castle) is found at the entrance to the valley. The Motte overlook a mini pilgrim landscape of two natural caves and a boulder all linked to St Kevin. Although the earliest records of pilgrimage date to the nineteenth century the strong folklore tradition linking the area to St Kevin and its location on the route of St Kevin’s road suggests that this place would have held significance for passing pilgrims during the early and later medieval period. 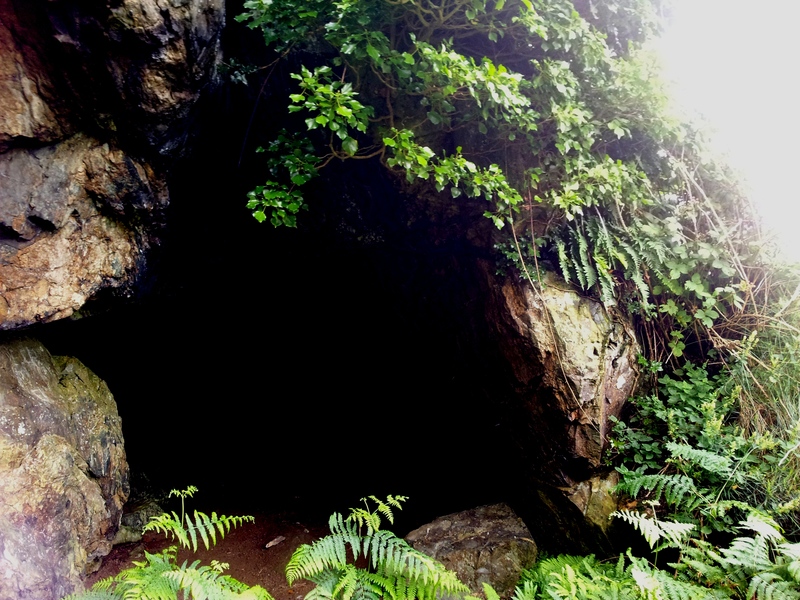 The two natural caves known as St Kevin’s Cave and St Kevin’s Bed are sited on a steep east-facing cliff face. I have visited the caves on a number of occasions, winter is definitely the easiest time to approach them as vegetation is low. The climb is steep and challenging. St Kevin’s Cave is the larger of the two caves. 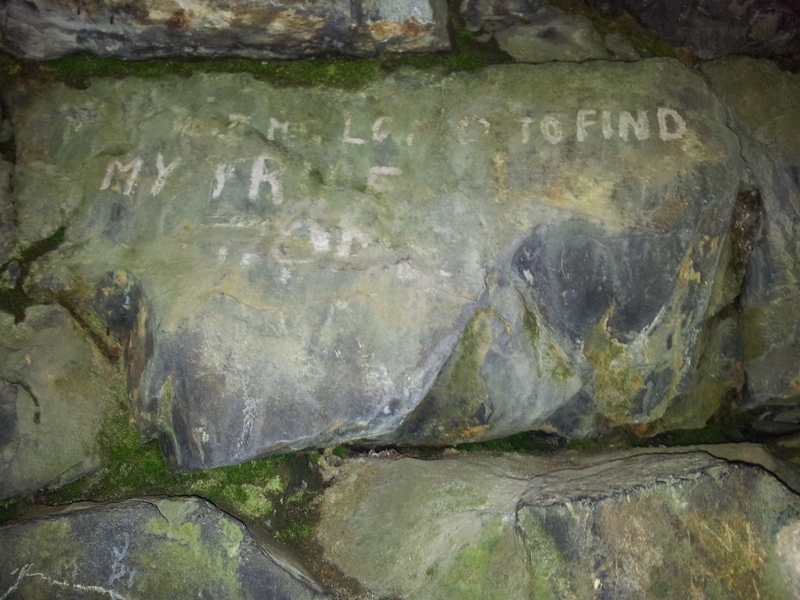 I found some graffiti at the back of the cave in 2006 ‘Help me Lord to find my home’ a simple Latin cross was painted over this inscription, when I visited again this summer the inscription had faded and the cross had disappeared. 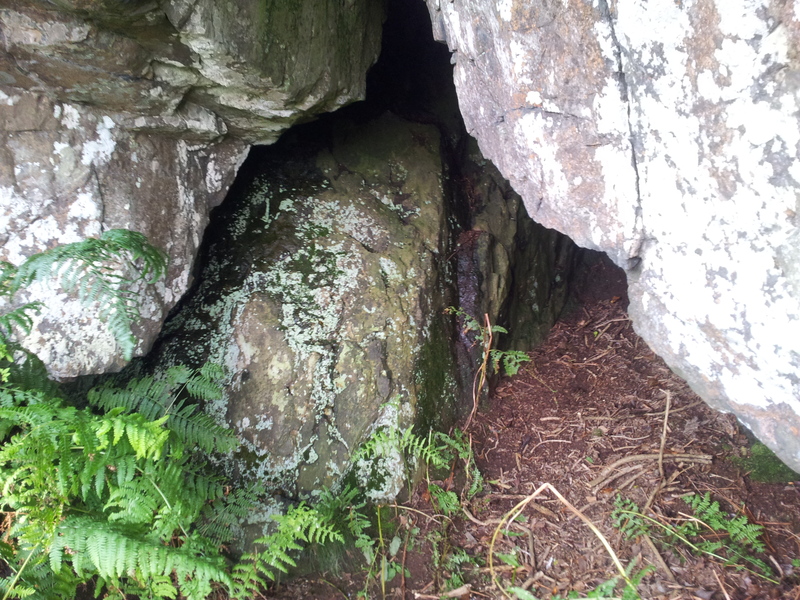 Close by is St Kevin’s Bed, a narrow vertical shaft that leads through the rock above . St Kevin spent time in both caves and supposedly used to sleep here. 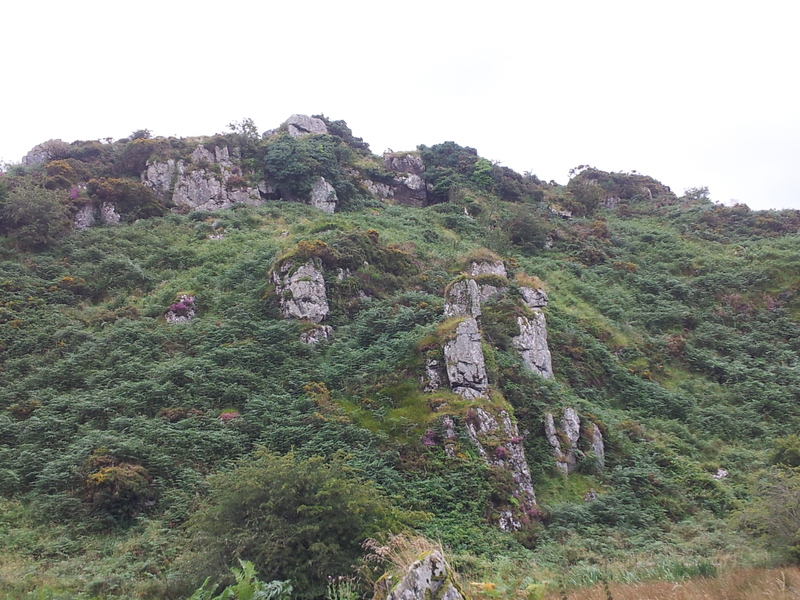 St Kevin’s chair is located on the floor the valley, directly opposite the caves . The boulder is hard to see despite its size, I always seem to walk past it. According to the Ordnance Survey Name Books (1840’s) St Kevin, in a fit of rage, threw the rock/chair from St Kevin’s Cave at a woman who annoyed him. Irish saints were not known for their patience. Sitting on the “chair” was supposed to cure backache. 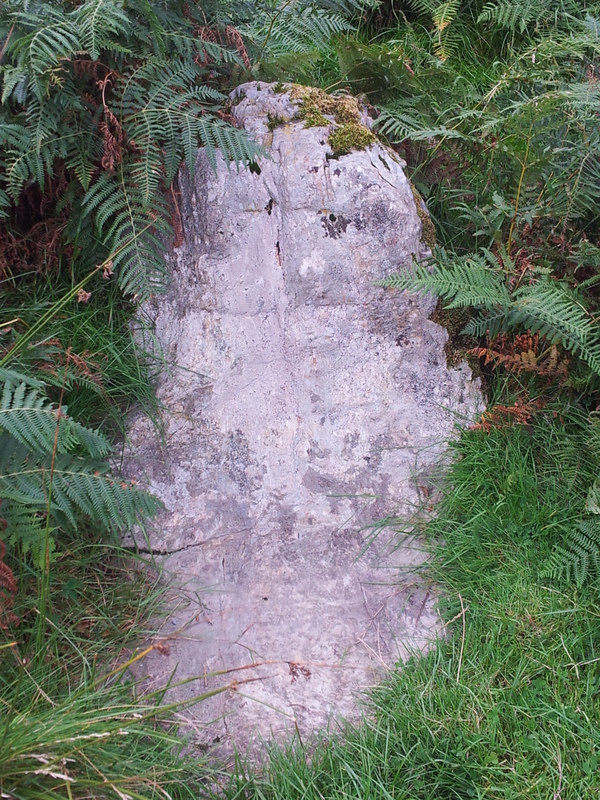 The stone known as St Kevin’s Chair. It should be noted that the pilgrim rituals at Glendalough included visiting a cave known as St Kevin’s Bed and a piece of natural rock called St Kevin’s chair . I am hoping to dig a little deeper into the history and folklore of the area in the coming months and I would be delighted to hear from anyone who has any other information on the area and past pilgrimages here. Corlett, C. 2003. 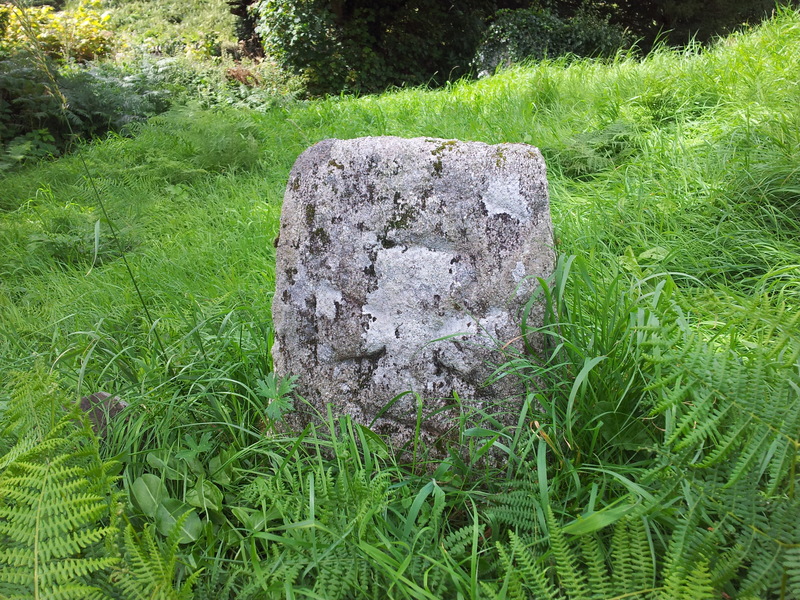 ‘The Hollywood Slabs- some late medieval grave slabs from West Wicklow and neighbouring Counties’, JRSAI vol. 133, 86-110. Nugent, L. 2009. Pilgrimage in Medieval Ireland, AD 600-1600. Unpublished PhD Thesis. Éoin Mhic Néil. Dublin: Four Courts Press, 244-71.
of Talbotstown Lower. Dublin: Dublin Institute For Advanced Studies. Today is the feast of St James the apostle. The saint’s shrine at Santiago de Compostela in Spain attracted large numbers of pilgrims from all over the Christian world during the medieval period. Medieval souvenirs purchased by pilgrims to Santiago have been recovered across Europe including Ireland. 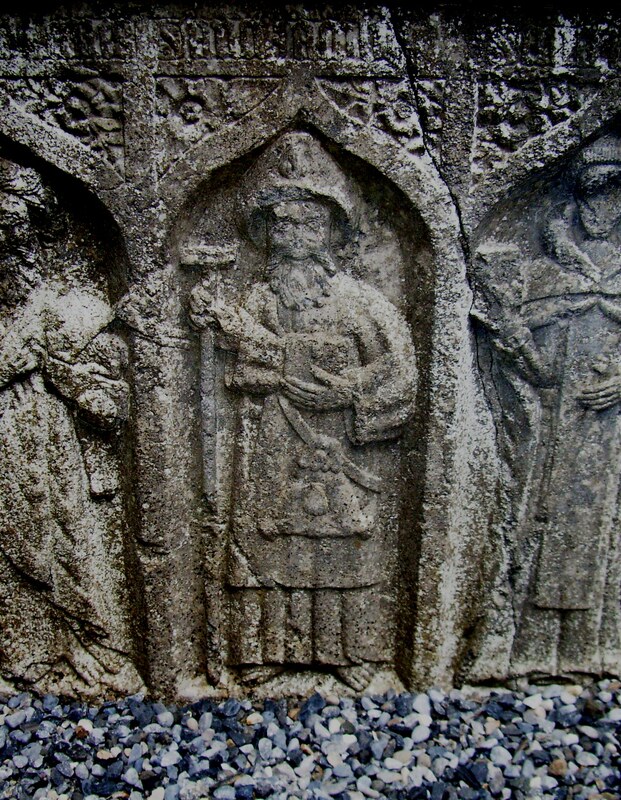 St James enjoyed great devotion in medieval Ireland and his image turns up on a number of Irish medieval tombs. Given the long distance of the journey from Ireland to Santiago and the requirement to travel part of the journey by boat, a pilgrimage to Santiago from Ireland was very expensive. Historical sources suggest that the majority of Irish pilgrims travelling to Santiago were from the upper echelons of Irish society. Pilgrims would have embarked from a variety of Irish ports such as Drogheda, Dublin, Wexford, New Ross, Waterford, Youghal, Cork, Kinsale, Dingle, Limerick and Galway (Stalley 1988, 398). Roger Stalley gives an excellent discussion of the literary and archaeological evidence for Irish Pilgrimage to Santiago in his article ‘Sailing to Santiago: Medieval pilgrimage to Santiago de Compostela and its artistic influences in Ireland’. Travel by sea was shorter than by land but it was not without its own hazards. Pilgrims traveling by sea were at risk from storms, disease and pirates. Bad weather was the biggest threat as storms had the potential of causing ship wrecks (Davies 1988, 47-48). There are many accounts of pirates attacking ships from Continental sources. Pirates were known to kill, kidnap and ransom or enslave pilgrims. A Lübeck chronicle dating to 1453 recorded the capture of some three hundred pilgrims returning from the Holy Land by hostile Saracens who killed all the men and enslaved the women (Ohler 1989, 48-49; Harpur 2002, 79). One of the most interesting reference to Irish Jacobean pilgrims dates to the year 1473. The 1473 account concerns Irish pilgrims traveling on ship called the La Mary London. The pilgrims appear to have been on their return journey from pilgrimage to Santiago when their boat was captured by pirates. It is not known exactly how the events unfolded but the pilgrims were later released in the port of Youghal, Co. Cork, although the ship had originally been destined to dock at Waterford. It is likely that the pilgrims were ransomed by the pirates. They had a lucky escape as they could have easily been, murdered or sold as slaves like the villagers of Baltimore in 1603 (Stalley 1988, 397 after Cal. Pat rolls. 1476-85, 78). Harpur, J. 2002. Sacred Tracks. 2000 Years of Christian Pilgrimage. London: Frances Lincoln Ltd.
Ohler, N. 1989. The medieval traveller; translated by Caroline Hillier. Woodbridge: Boydell Press. Stalley, R. 1988. ‘Sailing to Santiago: Medieval pilgrimage to Santiago de Compostela and its artistic influences in Ireland’, In Bradley, J. (ed.) Settlement and Society in Medieval Ireland. Studies presented to F.X. Martin, o.s.a. Kilkenny: Boethius Press, 397-420.